A few nights prior to the launch of the latest Leeu Passant wines, I had a strange dream; by accident, the Mullineux range was poured instead. Like most dreams, it can have lasted only a few seconds and was a flash happening rather than an episodic story. It also proved somewhat déja vu; on arrival at the actual Leeu Passant launch, a ‘preview’ glass of Mullineux Old Vine White 2017 was poured! Often, these ‘welcoming’ wines are sipped without much attention, as guests greet each other. Not on this occasion; this thrilling, chenin-based wine was given undivided attention by those around me. It’s tightly knit, spirited, flavourful beyond the varietal mix and just begs ageing; the best, if completely different from my (and Andrea’s) previous favourite, 2014. As I’ve already suggested, 2017 is a vintage to look out for, even if it is so far mainly white wines. But on to Leeu Passant. 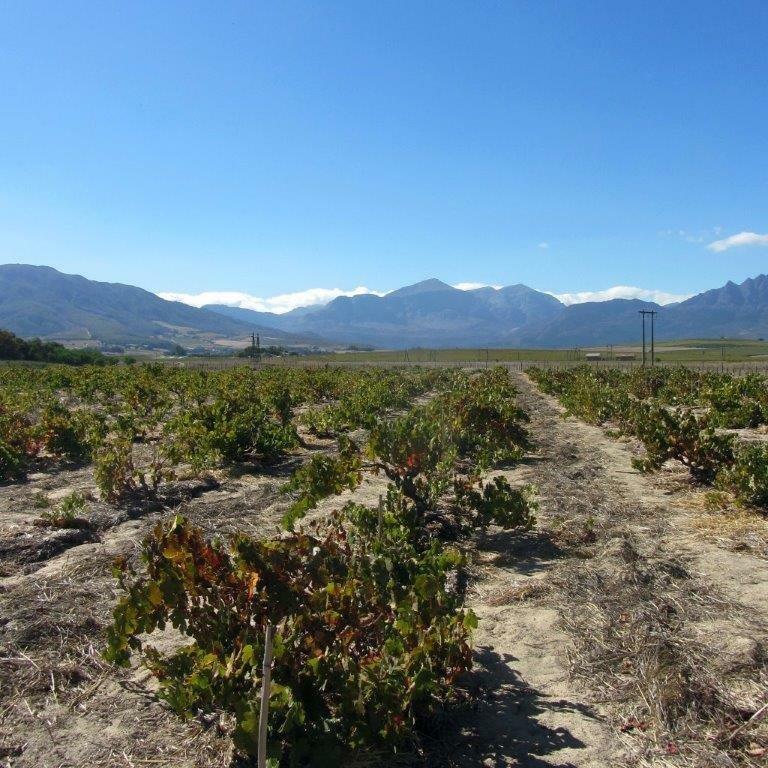 The project was launched last year with three wines, two chardonnays and a Dry Red from 2015; its genesis was viticulturist, Rosa Kruger introducing old vineyards to the Mullineux’s and their business partner, Analjit Singh urging the pair to make something from these old vines. The wines are made in the Franschhoek cellar, so from this year, totally separate from the Mullineux’s Swartland wines now vinified on their Roundstone property. The name and packaging also paints a clear line between Leeu Passant and the Mullineux brand, although their signatures are on the label. In the meantime, the Elandskloof Chardonnay has been dropped, leaving a two-wine range. Chris and Andrea Mullineux explained they wanted to focus on the Stellenbosch Chardonnay, finding this ‘doesn’t have to be forced into its style, which the Elandskloof did.’ From the high slopes, at the cooler, False Bay end of the Helderberg, there’s a bright, natural freshness and sustained, dry finish to balance ripe citrus flavours and oak. In other words generally warmer Stellenbosch in cooler mood. First taste was from a just-opened bottle; later we had the opportunity to try bottles opened the day before and three days earlier. More evident richness on the last suggests plenty of potential and interest to come over – perhaps a conservative – eight years. 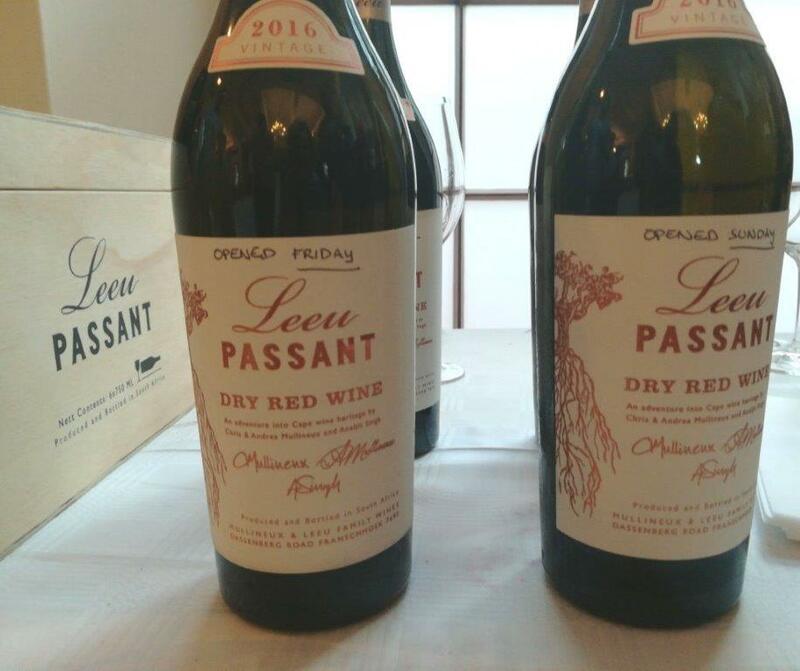 My entirely subjective view of Leeu Passant Dry Red Wine 2016 is that I without doubt prefer it to the maiden 2015, but then I am something of a grape tannin junkie. That shouldn’t be taken as any reflection on 2015’s quality, it’s a masterfully balanced wine reflective of a fine vintage. Varieties and vineyards are the same: 37-year old, bush-vine Stellenbosch cabernet sauvignon, cabernet franc from high on the Helderberg with very important third partner in cinsaut from South Africa’s oldest registered red wine vineyard in Wellington and second oldest in Franschhoek. Don’t underestimate cinsauts’ tannic contribution; tasted whilst still in the varietal stage last year was quite a mouth-puckering experience. But the vintage, as the drought began to take effect, has a major effect on the wine’s compact structure, a determined grip shielding the concentration of sweet fruit; very different from 15’s richer texture, caressing tannins that I noted last year. As with the chardonnay, there were a further two bottles opened a day and three days’ earlier to taste, with very little difference in the red’s case. It’s a long-termer; a good one to invest in for children turning 21 in 2037; whenever, it will be magnificent. The unambiguous name, Dry Red Wine, reflects the cabernet, cinsaut blends of the 1970s, something the Mullineux’s had in mind when they planned their own Dry Red, describing it as ‘a deconstruction and reconstruction’. For me, there are shades of those early blends in 2016, more so than 2015. To give stylistic context to the Leeu Passant pair, they were poured alongside two well-regarded chardonnays (Au Bon Climat 2015, Santa Barbara; Henschke 2015 Croft, Adelaide Hills) and reds with cabernet (Tenuta San Guido 2012 Sassicaia, Bolgheri; Domaine de Trévallon 2014 Alpilles Rouge). If stylistic context was the intention, one could understand their inspiration; it was also evident they didn’t need to stand back for any of these quality international producers. There’s been some discussion about pricing of these wines, specifically in the UK (ex-cellar the Chardonnay is R650, Dry Red R975, incidentally neither the most expensive in their respective category) where they’re going for £80 or thereabouts. Pricing seems to be South Africa’s Achilles heel: we’re either too cheap, good value or raise eyebrows. As I see it, it’s the first two levels which cause the main problem for the third, the gap between them emphasising the disparity of the high end. What consumers will pay for a bottle of wine has as much to do with the producer’s reputation and track record as the consumer’s level of interest in wine and the price itself. It’s 10 years since Chris and Andrea made their first wines under the Mullineux label, during which time they’ve become one of South Africa’s most trusted producers with an enviable track record. This plus consistent visibility in the market, several accolades – Platter’s Winery of the Year, Andrea’s Wine Enthusiast Winemaker of the Year – also generate confidence when the price tag is high. In the case of both seriously good Leeu Passant wines, I see no need for raised eyebrows.